There are not many progressive blackjack games available on the net, which makes Microgaming’s Triple Sevens online blackjack even more interesting. Particularly to those players who are secretly hoping to hit massive instant cash prizes at least once in a lifetime (aren’t we all?). You should treat this game as a typical Microgaming blackjack with one huge exception – namely, in case your lucky star shines and bring you three diamond 7s, you may win a progressive jackpot. But even if your sevens are not of the same suit, you will still be eligible to great payouts. Even more, two 7s or even a single 7 in your hand award decently. But don’t forget, it’s not all about the 7s. The main aspect of the game is still your regular blackjack. There are two additional Progressives available online: Playtech progressive blackjack which you can play for free on our site and another one by WGS, which is the only Progressive blackjack for US players. It is very important to note that Triple 7s is played with 5 standard decks of 52 cards. Why is it important? With games that feature such side bets, the winning odds grow with every new deck of cards in play. Logically, there is a bigger chance to win a progressive jackpot if one (or more) additional 7 of diamond lies somewhere among the other cards. You will be able to play by up to 5 hands at the same time and the general rules are applied to each hand, meaning you will need to place 1 credit side bet for each hand. Triple 7s side bet is separate to your main bet and you can win your regular game and lose the side bet and vice versa. 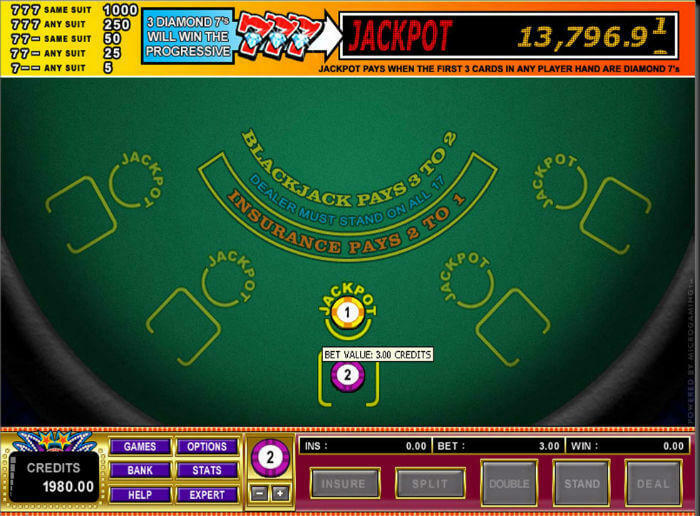 The Jackpot circle positioned above the main bet box is used to place the side bet. In order to make a side bet win your first card has to be a 7 and if more consecutive 7s are dealt to you, the payouts will rise substantially. The more 7s the bigger the prize and the progressive jackpot is won when three 7s of diamond end up in your hand. One important thing to remember is that unlike other side bets, such as Perfect Pairs or Lucky Ladies Blackjack, Triple 7s side bet is mandatory and it will cost you 1 coin in each round. Aside from the side bet, the rest of the game is more or less a standard form of the European blackjack. The dealer acts according to the strict rules including hitting on all 16s and standing on all 17s, while only one card is dealt (face up) to the dealer. The splitting is allowed, but only once, and in case you have split a pair of Aces the other 10-valued card will bring you a total of 21, but not the blackjack. You may double on any hand that has a value of 9, 10 or 11 and only one additional card will be dealt to your hand. Surrender is not permitted, but you are free to buy Insurance if the dealer’s up-card is an Ace. Now to the interesting part: how much Triple Sevens progressive jackpot can be worth and what are the odds and payouts of the game. The jackpot seeds (lowest point) at $10,000 and goes up till it pays. The latest payout which occurred just a month ago, in August 2016, was worth $123,400, and below you can see a screenshot of another one, slightly smaller. Below you can see the side bet payout odds and below the table we will explain when it reaches the point when you have an edge above the house. Three sevens of diamonds ? 0.000004 ? Under those rules, the break even point (0 house edge) is $90,000. When the jackpot goes above that number, you have an edge above the house on the side bet. If we include the main bet, then you need the jackpot to go above $92,500. We have already mentioned that the probability of hitting a progressive jackpot in this kind of game is directly related to the number of decks in play. The truth is that the jackpot winning odds are meagre by all standards, but that is the case with the majority of progressive games at both online and land-based casinos. This, however, does not stop numerous players from enjoying such games, especially since they are not all about progressive jackpots. On the contrary, Triple 7s awards even if a single 7 finds its place in your hand. The biggest (and the sweetest) dilemma any player will have is when the first two cards are a pair of 7s. The bravest could opt for a split, trying to win more with additional 7s that could show up. Yet, the payout of 25 to 1 is not to be disregarded, so think twice before your risk turning your safe profit into a tricky operation. In conclusion, Triple 7s brings joyful refreshment to blackjack, allowing the players to win larger-than-usual payouts on the one hand, but obliging them to make a side bet on each hand. However, the diehard blackjack devotees probably won’t mind an additional wager as long as they can reasonably expect larger prizes. The game comes in a nice outfit as usual with the Microgaming blackjacks, with green real-like felt and authentic graphics (even if cards look a little bit odd – they are bolder and brighter than the real cards, but that is done on purpose and it is quite useful in this case). The handy layout with all the main buttons grouped along the bottom, makes it easy to play and speeds up the gameplay. The Expert Mode has an inbuilt auto play feature and Strategy Card can be used as well.